Perhaps you are have a pre-existing crash reporting facility or are generating dump files using MiniDumpWriteDump on Windows, this guide shows you how to submit these over HTTP or HTTPS. If you are using a supported crash reporting library, please use their preferred submission mechanisms. First step is to ensure you have a submission token created. Learn more about submission tokens in the product guide. Next step is to ensure that a listener exists for submitting crash data. 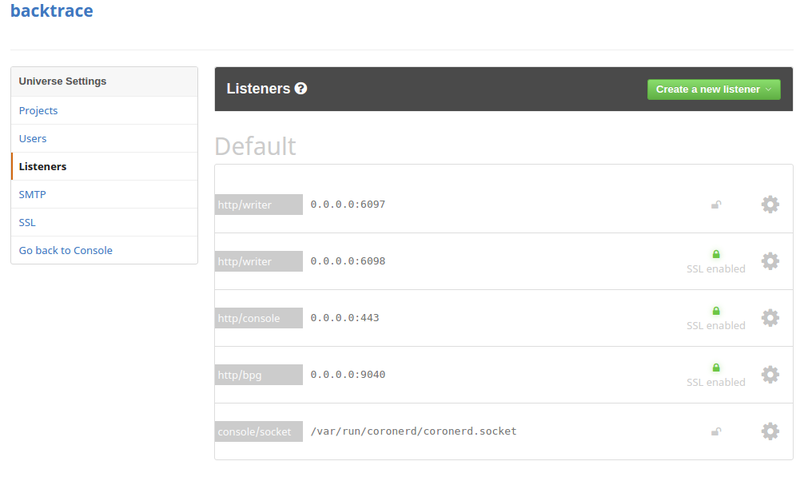 Look for listeners with the http/writerlabel. Listener settings are found under the Configuration Organization menu item. In the above example, if the server is hosted at testing.company.com, then we are able to submit dump files to either http://testing.company.com:6097/post or https://testing.company.com:6098/post. These are the first two entries in the above screenshot, with the http/writer labels. For large files, include the header flag -H "Expect:" to override some default curl behavior which can cause issues when uploading to Backtrace. The examples below include this flag. For this example, let us assume that our submission token is 7e7f38ea321471dfdf76adad1bd101c4ec1010dd6eee113d347f6137179ed9c3 and that the http/writer end-point is https://testing.company.com:6098/post. An HTTP POST is used to submit a dump file. See below for an example curl invocation. curl -v --data-binary @example_minidump.dmp -H "Expect:" "https://testing.company.com:6098/post?format=minidump&token=7e7f38ea321471dfdf76adad1bd101c4ec1010dd6eee113d347f6137179ed9c3"
Both the token and format parameters are required in order for the dump to be submitted. User-defined attributes can also be passed as additional query string parameters. For example, let's say that we wanted to submit a minidump and set the version attribute associated with it to 1.0.
curl -v --data-binary @example_minidump.dmp -H "Expect:" "https://testing.company.com:6098/post?format=minidump&token=7e7f38ea321471dfdf76adad1bd101c4ec1010dd6eee113d347f6137179ed9c3&version=1.0"
For more information on attributes, see the product guide. curl -v -F "upload_file=@example_minidump.dmp" -H "Expect:" -F "attachment_config.json=@config.json; type=application/json" "https://testing.company.com:6098/post?format=minidump&token=7e7f38ea321471dfdf76adad1bd101c4ec1010dd6eee113d347f6137179ed9c3"
curl -v --data-binary @config.json -H "Expect:" -H "Content-Type:application/json" "https://testing.company.com:6098/post?token=7e7f38ea321471dfdf76adad1bd101c4ec1010dd6eee113d347f6137179ed9c3object=5&attachment_name=config.json"
Note that curl requires explicitly specifying the Content-Type for attachments, as demonstrated, but a custom client can omit this parameter. In this case, the server will automatically determine the Content-Type based on the attachment's name. It is also possible to use the https://submit.backtrace.io receive layer to submit dumps. This is preferred to use over port 6098 for better quality of service. This is only an option for hosted customers. For on-premise, it is possible to customize listeners. The token is the submission token. Universe is your tenant name. For example, if your instance is X.sp.backtrace.io then the universe component is called X .
curl -v --data-binary @file.dmp -H "Expect:" "https://submit.backtrace.io/backtrace/fd143f0d607b492a1835f3e67dab0dd240dc6976d9ba9de849fe8e1fdf187fb2/minidump"